Originally written for Scout London. “I suppose circumstances have conspired to make some kind of happy ending,” actor Edward Petherbridge reflects, a smile in his voice. It’s an unlikely comment, given that Petherbridge is discussing the major stroke that he experienced while rehearsing for a production of King Lear in New Zealand in 2007. One day he was preparing for one of the greatest tragic roles in the theatrical canon; the next, he was barely able to move. Petherbridge describes the “episode” – he rarely uses the word stroke – as “completely unexpected and swift and sudden”. But while the stroke initially left him physically debilitated, unable to even move his thumb and index finger together, he soon discovered that the role of Lear was still stubbornly lodged in his mind, word for word. It was this extraordinary discovery, paired with a continuing fascination with the part he was robbed of, that eventually led to Petherbridge’s “happy ending” in the form of a show in which he finally gets to play Lear – sort of. “I said to Paul Hunter in an idle moment when we were doing The Fantasticks together that I thought we could take a two-man Lear to the Edinburgh Festival,” Petherbridge explains. “He said, ‘well I might have a better idea than that, which is a show about you not doing Lear’.” The final product, emerging from a process of improvisation and devising, is My Perfect Mind, currently on tour ahead of a run at the Young Vic. Marrying Petherbridge’s experience with chunks of text from King Lear, co-deviser and performer Hunter describes the piece as a “strange, dreamlike journey through Edward’s brain”. Petherbridge plays himself and Lear, while Hunter single-handedly takes on all the other roles, from Petherbridge’s doctor to Lear’s fool. “I don’t think either of us knew quite what the show would be that we might come up with, and I’m still rather amazed at what it is,” Petherbridge admits. Despite the trauma of the stroke, he tells me that there was little hesitation in taking Hunter up on his initial suggestion and mining those difficult experiences for theatrical material. This surprising lack of trepidation might even have something to do with the consequences of the stroke itself. “I heard on the radio not long after the stroke that the synapses that generate regret are often disabled by the brain damage that comes with it,” Petherbridge says by way of explanation. While the nightly re-enactment of such a painful episode might sound challenging and emotionally exhausting, Petherbridge plays down these difficulties, turning again to Lear. “Someone asked me last night whether I found it at all painful or difficult,” he says, “but it’s no more painful than Lear’s much more gargantuan difficulties; mine pale into invisibility when compared with his.” He pauses for a moment, before adding, “and if acting isn’t a pleasurable experience, why do it?” This joy for acting and the theatre, which has clearly driven Petherbridge’s long and successful career, seems to have had an almost medicinal effect in the aftermath of the stroke and throughout the process of making this show. Indeed, Petherbridge refers to it fondly as “doctor theatre”. 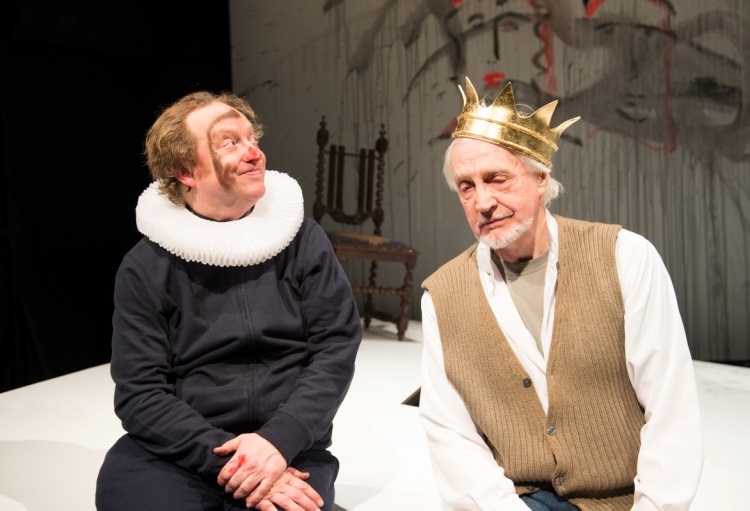 The result, told in the absurd and madcap style characteristic of Hunter’s theatre company Told by an Idiot, is dreamlike and ever-shifting, rapidly jumping between Petherbridge’s life and the fictional world of Lear. As Petherbridge puts it, “it’s like a kaleidoscope of different bits of my life that Paul has shaken up”. There’s an evident connection between content and form, narrating the brain’s complex recovery from trauma in a way that reflects the extraordinary and often unexpected quirks of the human mind.